Please note that all photos on this blog are copyright protected by designhistory.org and eallen photography © 2012. In 1539, seventy years after German printers introduced their craft to Spain, the Spanish became the first Europeans to export printing to the New World. Their motivations were to produce religious tracts in both Spanish and native languages to evangelize the indigenous population as well as supply the needs of church and university communities in Mexico. 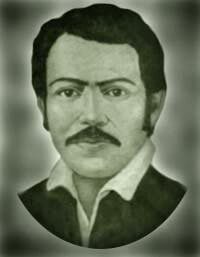 To accomplish this goal Spanish civil and religious authorities negotiated with Sevillian printer, Juan Cromberger, to create an overseas branch in Mexico City. Cromberger appointed his employee, Italian-born Giovanni Paoli (Juan Pablos), to set up and manage his New World press. An entire print shop’s inventory including press, type, paper, ink supplies, tools and staff were freighted over the Atlantic Ocean and transported overland into the interior of Mexico. The shop crew included Pablos, his wife Gerónima Gutiérrez (who by terms of the contract worked alongside her husband without a salary), Gil Barbero and Pedro, a black servant. 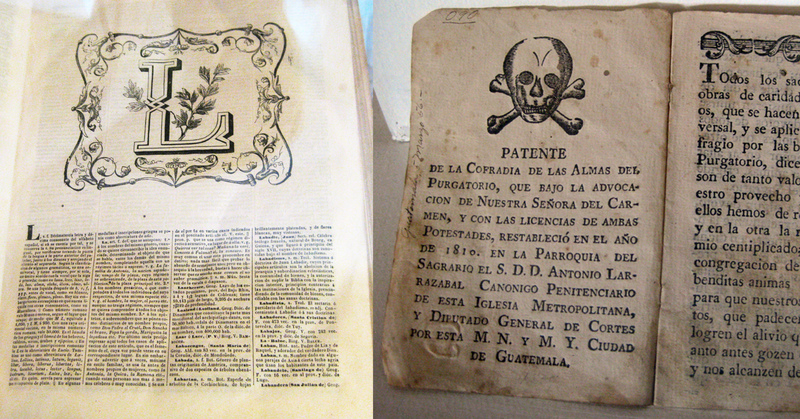 The difficulty of importing type and paper from Europe coupled with political and religious restrictions on printing dampened the Mexican printer’s design innovation. 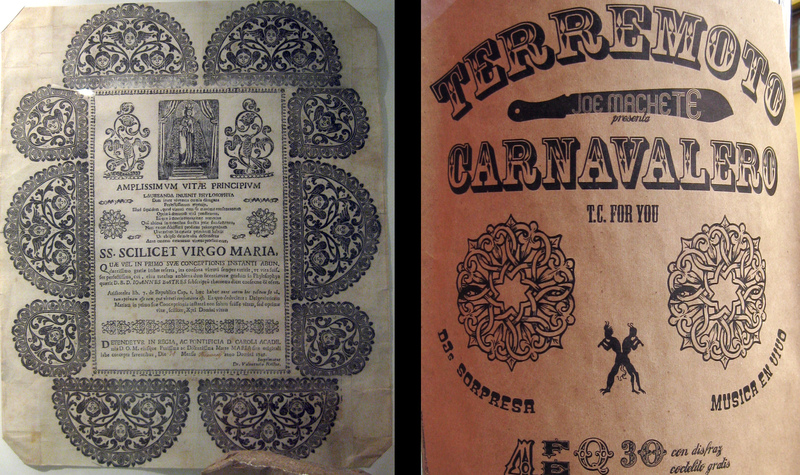 Typographic advances did eventually begin with the arrival of Antonio de Espinosa (d.1578) in 1551. It is believed Espinosa cut typefaces for Pablos, introducing the Renaissance styles of roman and italic types to replace the press’s Gothic Rotunda forms. Espinosa eventually started his own press where he produced his 16th century masterpiece, Missale Romanum Ordinarium, in 1561. In 2010 Mexican-based type designer Cristóbal Henestrosa digitized a revival type design, Espinosa Nova, based upon the faces used by the Espinosa press. You can read more about his award-winning design here. Printing spread very slowly from Mexico City through Latin America. A second Spanish press was established in Lima, Peru in 1581 by Antonio Ricciardi (an Italian who printed in Mexico for 15 years prior). In 1640 the third Spanish press center was based in Puebla, Mexico and it was from that location that a press and printer were procured for initiating the fourth Spanish-American printing press in Guatemala. Once he was settled into his shop Ibbara set about production of ecclesiastical pieces, the first a sermon by monk Francisco de Quiónez. Because of the vast number (50) of monasteries and nunneries the workshop bustled with work, enough to engage one or two typesetters, two printers and an apprentice for 12 to 16 hours a day. The subject matter included eulogies, sermons, books of hours, regulations, and descriptions of religious festivities. In 1663 Ibbara produced his most ambitious work, Bishop de Rivera’s 700 page Explicatio Apologetica Nonnullarum Proposititionum a Theologo Quandam Non Dextere Notatarum. The shop typographic style was more Renaissance roman rather than the traditional rotunda gothic. Ibarra also acted as a book binder and book seller until his death in 1679 whereupon his son Antonio took over the press until 1721. 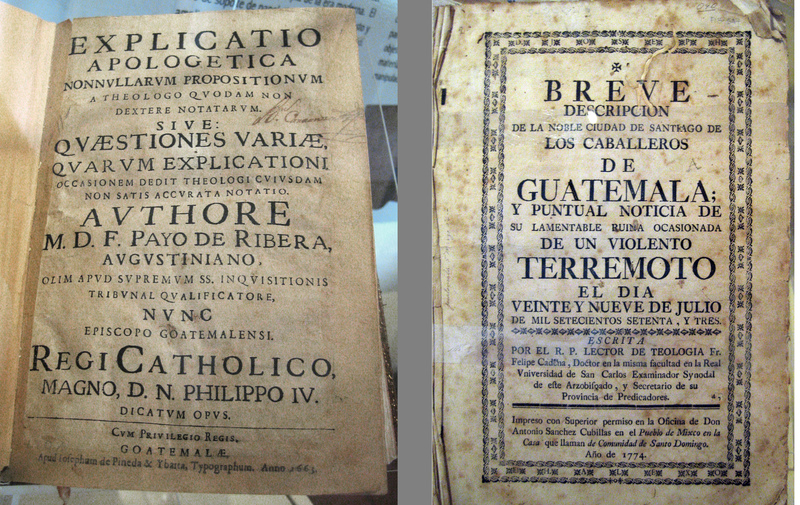 The first book printed in Guatemala, 1663 / (r) A 1774 account of the great earthquake. The Museo dei Libro Antiguo is small but earnest institution dedicated to the preservation and display of antique printed books, most notably those produced by Ibarra. It is located in the lovely Spanish colonial city of La Antigua, Guatemala, (formerly Santiago de los Caballeros) a green valley in close proximity to two inactive and one active volcano. Although once the nation’s capital, catastrophic earthquakes and almost total devastation in the 1700’s necessitated that the government move to the more stable location in The Valley of the Shrine, now Guatemala City. Today, La Antigua, despite having been rebuilt a number of times, is still filled the ruins of dozens of churches and cloisters—some worth visiting, some merely facades. The city was designated a cultural treasure by UNESCO in 1979. La Antigua’s central square is dominated by the arched city hall, Palacio Del Ayuntamiento, a host to municipal offices as well as to the Museo dei Libro Antiguo. Finding the entrance to the museum took a bit of persistence since none of the local tourist offices seemed to know that it existed, let alone where it was located. A YouTube video posted by a tourist provided the key— look for the door numbered 6 under the Palacio’s arched portico. Admission to the museum costs 35 quetzales (about $5 US) for non-nationals and 5 quetzales (about 80¢) for nationals. Inside the first room we found narratives beginning with Gutenberg’s invention of printing in Germany. 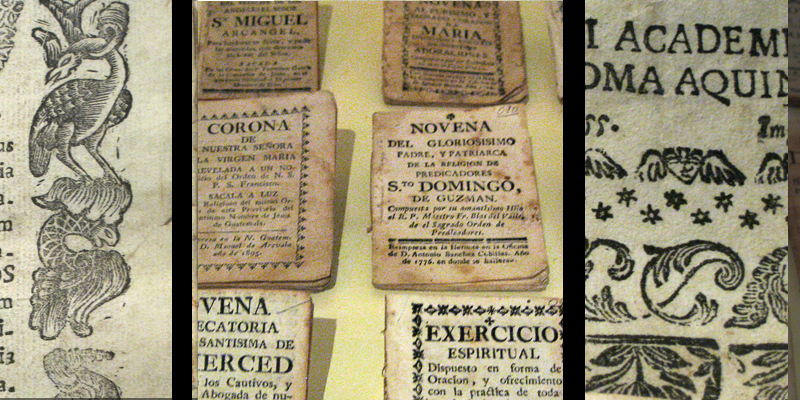 Displayed inside of glass showcases are early books from Spain and Spanish colonial presses. 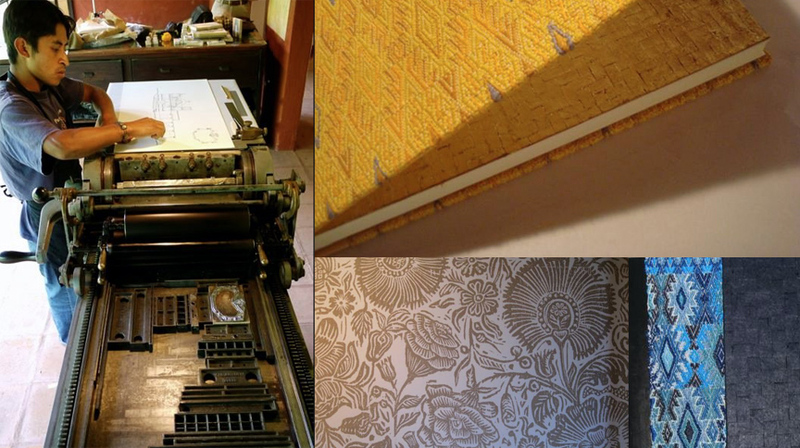 A second room concentrates on Ibarra’s printing and the use of lithographic stones and wood cuts for illustration. The prize of the museum is Ibarra’s Explicatio Apologetica (previously shown above). We didn’t recognize the type face used by Ibbara but with the aid of a very helpful librarian in the Centro Cuturale Espania we were introduced to a text on the life of Ibarra. Unfortunately that did not shed light on the face either so we throw an identification challenge out to you at this link. Sincretismo (the harmonizing of two religious beliefs) in Guatemala refers to the merger of the indigenous Mayan religion with the Catholicism of Spanish colonials. There also seems to be a harmony of visual imagery when we saw the decorative motifs used on books and printed ephemera around the city. The decorative book treatments reminded us of the intensive embroidery we saw on the blouses of the Mayan women. Traditional clothing is still worn in force by Mayans of all ages—especially women. We were intrigued by how a local letterpress shop, Libros San Cristobal, integrated the native textiles into their book bindings. Other regional materials are used— handmade amate paper (produced from a 1952 recipe), local sheep parchment, and alligator and jade closures. 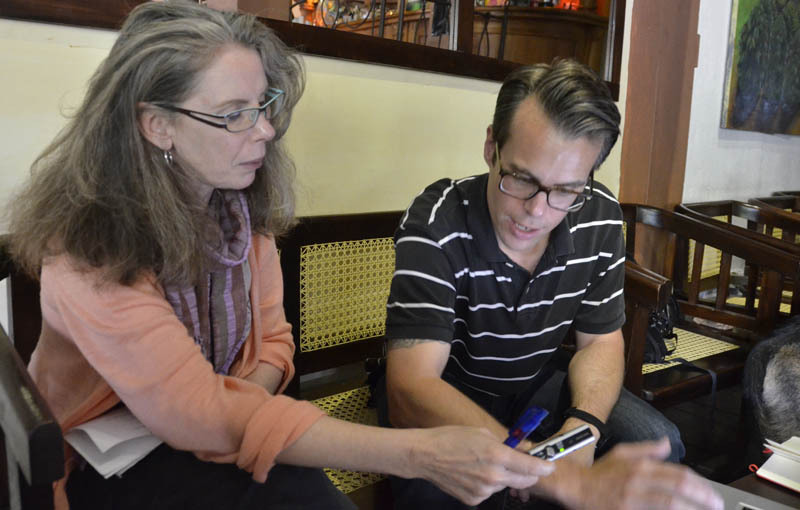 Editor Catherine Docter was out of town at Codex Mexico, a fine book fair/expo. We’ve included a few images from their Facebook page (no web site at the moment). Colors at the women’s clothes wash / Chicken Bus! La Antigua is a tourist destination but also the jumping off place for foreign volunteers who begin their service by studying Spanish in the numerous local language schools. Alongside the great influx of foreign aid workers there are Guatemalan-based efforts for education, health, safety, etc. We visited with one local graphic designer, Brad Eller, who integrates his commercial talent with volunteerism by teaching computer skills to underprivileged children and donating pro bono work to deserving causes. Initially we discussed the contemporary graphic design scene in Guatemala. 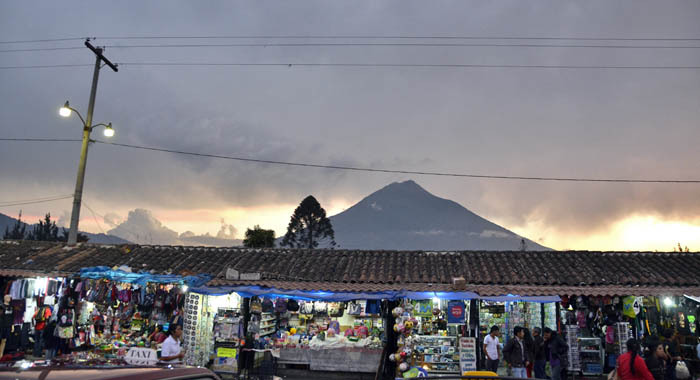 As an American who has lived in Guatemala for the past few years, Brad still has the perspective of an outsider yet, because his wife is Guatemalan, understands the mindset of the current culture. He observes a general conservatism that he suspects is due to the aftermath of Guatemala’s period of La Violencia, (1960–1996). During that period over 400 Guatemalan indigenous villages were burned to the ground, more than 600 massacres were committed and more than 200,000 people were either killed or disappeared. Just a little over a decade after a truce was brokered by Norway, Guatemalans are still getting used to (relative) stability and safety and have not had time to develop beyond their artistic traditions. Despite conservatism, Eller notes that Guatemalans are very heavy Facebook users —for family communication as well as a source of information. It is common for companies to place their primary website on Facebook rather than worry about a free-standing site. For local inspiration he looks to other Guatemalan designers, noting the work of Sandra Monterroso. Eller’s design work, mainly web, caters to the tourist/service industry but he appreciates opportunities to give back to Guatemalans. We reviewed his upcoming redesign for HablaCentro‘s web site, an organization that functions as an uncensored on-line publication for Central American writers. A major innovation in the new design is the inclusion of the Mayan language of Kaqchikel as an option alongside English and Spanish. Another cause Eller has been involved with is Corazón de Mujer, a collective of Indigenous women, all victims of domestic violence, who weave scarves to support themselves. Eller created a fund-raising calendar with written and photographic portraits of women in the organization. Back in the wintry US we miss a lot about La Antigua — our daily trip to the vegetable market, the unpredictable puffs from the volcano and the rich mixture of Mayan, Spanish and international culture. Like so many places we’ve seen before, we would like to return again some day. But for now we are laying out our plans for the next excursion.